Pope Francis addresses a joint meeting of Congress on Capitol Hill in Washington, making history as the first pontiff to do so, Sept. 24, 2015. The atmosphere inside the House chamber was electric. Nearly all of the 535 members of the House and Senate were present, along with four Supreme Court justices and several presidential candidates, including Senators Marco Rubio, Bernie Sanders and Lindsey Graham, New Jersey Governor Chris Christie, and neurosurgeon Ben Carson. 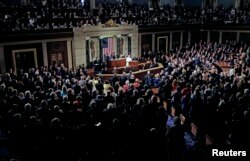 Tickets were hard to get to witness Pope Francis make history Thursday as the first leader of the Roman Catholic Church to address a joint meeting of Congress. The occasion had the feeling of a presidential inauguration and a State of the Union address rolled into one. But it was less partisan in tone and the reactions to it were less mixed. The pontiff from Argentina, whose first language is Spanish, spoke softly, slowly and deliberately in accented English. Lawmakers listened attentively, many of them on the edge of their chairs. Pope Francis addresses a joint meeting of the U.S. Congress in the House of Representatives Chamber on Capitol Hill in Washington, Sept. 24, 2015. His call for a “renewed spirit of cooperation” comes at a time when the divisive Congress may be only one week away from triggering a partial government shutdown. Pope Francis made the Golden Rule from the Bible's New Testament the cornerstone of his speech: "Do unto others as you would have them do unto you." He applied it to the Syrian refugee crisis and to the thousands of migrants from Latin America who travel north to the United States in search of a better life. Democrats in the chamber, most of whom support immigration reform, applauded enthusiastically when Francis said foreigners should not be feared "because most of us were once foreigners." He challenged everyone not to see migrants as numbers, but as faces. “The yardstick we use for others is the yardstick which time will use for us,” he said. The pope also spoke clearly about human activity causing climate change, saying Congress has an important role to play in minimizing the damage caused by environmental degradation. The pope explicitly called for the abolition of the death penalty and said society can benefit from the rehabilitation of those convicted of crimes. Francis’ plea for the sanctity of marriage and the family, and respect for life at all stages won him an enthusiastic standing ovation from Republicans, while some Democrats did not applaud. But overall, the pope was received warmly and with respect by all of the members. Lawmakers were on their best behavior, after having received guidance and pleas from congressional leaders. Heeding instructions, members let the pontiff walk down the center aisle to deliver the speech without trying to shake his hand or hug him. It was a rare moment of unity for a Congress that is bitterly divided on a number of substantive issues. Independent Senator Bernie Sanders, who is running for president as a Democrat, also used part of the pope's speech to highlight his main campaign issue, telling VOA: “Most importantly, what he said today: the function of an economy is not just to make the rich richer; the function of the economy is to serve all the people."